On a recent photo trip to Alaska’s McNeil River, I spent four days observing and photographing Brown Bears. The bears routine became pretty obvious – they’d fish for a while until their bellies were full, then they’d wander off into the grass for a little nap. 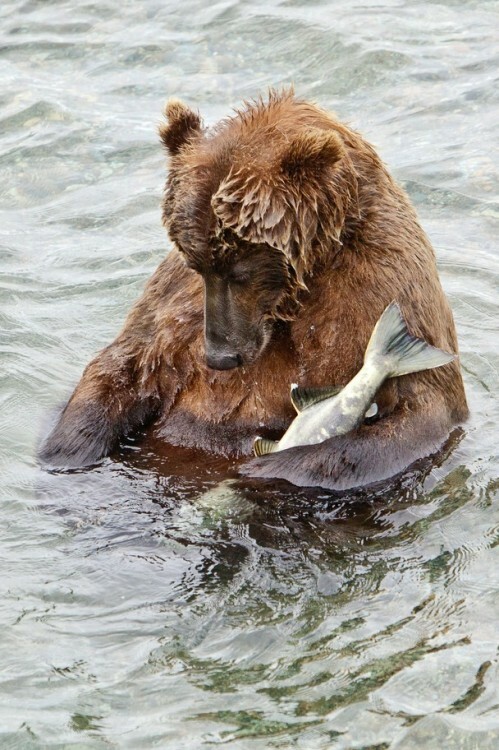 This ole gal never quite got that far – after snaring this salmon, she wandered into a shallow pool at the side of the river, cradled the fish under her arm, and promptly nodded off. It was really comical to see her just sitting there sound asleep. It’s an entry in the 2011 National Geographic Traveler Photo Contest, which is still open for entries, but only through July 11th! Find out all about the contest at National Geographic Traveler. Link -Thanks, Marilyn!